Ok, so can we please start with the simple stuff: how, when, where and why did Lions Of Tsavo get started? Ryan (vocals/guitar): Well, basically around 2003, Josh [Dawkins, drums], I and our original bass player Matt moved down to Austin, TX from Ohio to give Lions Of Tsavo a fresh start in a new city. I had been to Austin quite a few times by then, and thought it would be a great place to live and play music. We had all been in bands together previously, so we knew it could work, and I pretty much had the band name as well as the concept along with four or five songs written by that time to convince them. It took us about a year to get things rolling, but by 2005 we were recording our first record with Billy Anderson and playing shows pretty regularly. In 2008, Daine joined on bass while Matt switched to second guitar – that was around the time we recorded the ‘Swarm Of All Unholy’ EP, but that lineup only lasted about a year before Matt departed and we reverted back to a three piece again. What was the initial plan for the band, and how do you think you’ve kept to (or strayed from) it? Ryan: The initial concept tying into the band name itself was the idea of ‘nature versus humanity’, Mother Nature taking back and righting the wrongs of mankind’s tampering. We’re exploring the possible consequences of hundreds of years of environmental destruction caused by our hands, as well as pointing out the reality of already occurring events. We’ve kept that going as a common thread throughout our work, even as we grow and try new things musically and lyrically. How would you say the band has grown and developed over time? Ryan: I think mainly we have grown in our attention to detail/composition and the ability to execute our ideas better, especially when looking back at the almost blind fury and unchecked rage of our early material. ‘Traverser’ was a huge leap forward for us, as far as having a defined storyline/theme for the record, as well as the amount of time spent hammering out the song structures and the way everything flowed together. Basically I see ‘Tsaunamicron’ as the record of a young band trying to find its feet and identity, ‘Firelung’ as the next logical step showcasing both the path forward as well as some dead ends, the ‘Swarm Of All The Unholy’ EP as an experiment in adding more progressive elements and seeing how much ‘heavier’ we could get, and ‘Traverser’ as the culmination of everything taken to a new dynamic level. Daine (bass): When I moved to Austin in 2007, ‘Tsunamicron’ was the only recording at that time, and I thought it was a very fresh take on heavy music. It was pummeling, but it wasn’t boring in that typical ‘metal band’ kind of way. The writing was strong; you could hear some different influences but it was unique – that’s what personally drew me to the band, and I’d like to think we have continued building on those ideas. What can you tell us about ‘Traverser’? What went into it and led it to be the way it is? Are there any specific themes or ideas running through the record? Ryan: Long story short, the whole concept for the first half of the album is Mother Nature wiping the earth clean through various plagues and natural disasters save for one individual referred to as the “Traverser”. They are then reborn at the point where life began and forced to walk across the earthen landscapes, whilst seeing the horrors of humanity through the eyes of every creature in existence. It is also kind of an ongoing story that I don’t necessarily see ending with these particular songs. I guess we embraced our inner prog leanings with this one, but the whole concept was a great inspiration to us finishing the songs and giving them purpose. Daine: The writing process for this record took a couple of years to complete, which helped to give diversity to the songs. We were able to take time to grow as a band, and in turn to craft the best possible compositions while following a certain concept. ‘Chemotrophs’ and ‘Sea Of Crises’ were the first to emerge, and then ‘Bestial Heavens’, which were all steps in different directions. I think we all had the same idea, but wanted to experiment in how to convey the central storyline while still challenging ourselves in how we write music together. To me, it’s a very ‘complete’ album: it’s not something you can necessarily dip into – you have to experience it as a whole piece of work. Was it conceived and written as such, or is this just a happy accident? Ryan: It was very much conceived as such, and I intentionally sequenced the songs in a way that made the entire album flow together as a journey…something you had to experience as a whole rather than just a collection of individual moments. We also had the song order for the album pretty much set before recording even commenced, rehearsing the material in different combinations until we thought it worked best. We thought of the record being in two distinct halves, and that is actually how we ended up recording it. Daine: I hesitate to use the term ‘concept album’, but that’s basically what it is. Every song progresses the storyline to its ultimate conclusion. The idea was that on vinyl, the A side and B side would be quite different. It also seems incredibly taut and well-regimented. Are these songs mapped out carefully and precisely, or is the process looser and more organic than that? Ryan: A little of both. We spent a lot of time working on every aspect of every song, but a few of them came about pretty organically, through the process of improvising and exploring things that just ‘happened’ at rehearsals. Everybody put their input into the process as we structured the songs, and we were all very happy with the outcome as a result. It’s obviously been a while since the album came out, so what have you been up to since then? Ryan: We did some touring throughout 2014 as well as steadily playing shows in and around Austin, TX. We’ve also been working on new song ideas since ‘Traverser’ was finished. Are you working on new material already? If so, how would you say it compares to the ‘Traverser’ stuff, and what did you learn from the writing/recording process? Ryan: We are getting pretty deep into the writing process for the next record. So far everything is sounding massive and in many ways both more progressive and focused than ‘Traverser’. I personally see ‘Traverser’ as being shrouded in a melancholic and hazy atmosphere, and in a way I wanted to break out of that for the next one. Not just to have the songs be more ‘forceful’, but also to not repeat ourselves. The self-production on ‘Traverser’ was highly rewarding and beneficial towards making the album we wanted to make, but it was also very much a learning curve and certainly took its toll on my sanity in a way. At this point, I’m not sure whether we will be self-producing again or going into a studio and having someone else take control of the recording process, but I’m looking forward to getting it done regardless. Daine: We are always working on new things. Even before ‘Traverser’ came out, we were already hammering out potential riffs for new songs. We all love writing. It’s my favorite part of playing music. To me, the band lobs in a whole load of different influences from right across the metal spectrum. 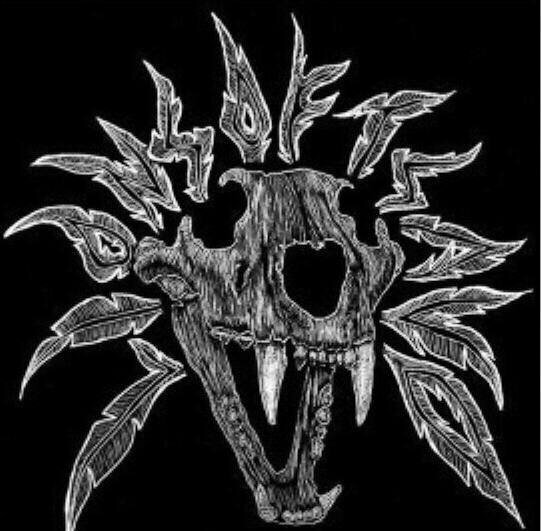 While there are plenty of bands doing this, Lions Of Tsavo do it in a way where it’s almost impossible to see where the joins are: there’s no sense that ‘this is the black metal bit’ and ‘this is the mathy bit’. Do you have to work hard to get the flow of things right, or is it an easy process and I’m just making too much of it? Ryan: Honestly, we just write songs we want to hear. We don’t focus that much on incorporating too many obvious or direct influences into the material. Sometimes the process is natural and sometimes it involves a lot of work to get to where we need the song to be. Also, there is a pretty wide range of influences between the three of us, so sometimes it might be that individually we are approaching certain parts from different angles, and that’s what makes it unique, hopefully. Of all the genres you splice together, where would you say your hearts truly lie? Ryan: There are certainly common thread bands the three of us share, from the Melvins, Neurosis, Unsane, and Deathspell Omega to Pink Floyd, Rush, King Crimson and Black Sabbath, and even a lot of heavy 90s stuff like Kyuss, Soundgarden, Alice In Chains, Ministry, Godflesh, Tool, etc. I personally tend to gravitate towards the old Dischord (especially Hoover and Lungfish), Touch & Go, Amphetamine Reptile, and Gravity Records type of bands I grew up listening to, as well as post-punk stuff like Killing Joke and The Cure, but things like Failure, God Machine and 16 Horsepower/Wovenhand go hand in hand with listening to Voivod, Today Is The Day and His Hero is Gone…so I’m pretty much all over the place. Daine: There’s something about the songwriting in newer black metal that is extremely interesting to me; it’s basically taking all the previous unsaid rules of writing metal and throwing them out the window. The freedom that you have with song structure, time signatures, chord progressions – it draws a lot from prog and even jazz to some degree, and I really tend to gravitate towards that. But obviously nothing is better than the first five Sabbath records. I have to admit, it was seeing one of you wearing a Kerosene 454 t-shirt in a promo pic that piqued my interest in the band. This is lame, I know. Some e-research (aka cyber stalking) then led me to discover that at least one of you had been in Ambassador 990, a band I really like. What was the journey like from that band to this one? Were A990 closet metalheads or has the metamorphosis been a gradual one? Ryan: Haha, no man, that’s not lame at all! I love Kerosene 454, and I’m always stoked to talk to somebody who even remembers them. As far as A990 goes, at least Mike and I were pretty into metal at the time, and the stuff we were writing for the second record (which sadly never happened) was sounding a lot more Karp-ish and heavy. After we broke up, I ended up exploring some more ‘spacy’ sounds in bands and solo works before going back to heavy music. Also, Mike ended up forming Early Man which was full on heavy metal, so there you go. What did your time in a DIY punk band ‘teach’ you, and have you brought any of those experiences to bear on what you do with Lions Of Tsavo? How would you say tastes, behavior and audiences have changed over time and between genres? Ryan: It certainly gave me a foundation in the DIY ethic, that’s for sure. Knowing that touring and getting your music exposed is rarely a ‘luxurious’ experience, but it’s also one that toughens you up and makes any gains you happen to achieve highly rewarding. I don’t make this kind of music expecting to be sitting on a pile of money anytime soon or anything, I know these songs are a tough sell to certain people… but to me that makes it all the more rewarding when somebody actually ‘gets it’ and has the music affect them in some way. Daine: I wasn’t here in the early days of the Austin music scene; in fact, the area where I grew up was the complete polar opposite of Austin. So the opportunities this city provides are sometimes overwhelming – which is fantastic for young and underground bands – but can come as a bit of a shock to those who have yet to experience this sort of saturation. Most folks are definitely aware of the cultural and musical history here, and it’s not uncommon to run into some serious musical legends (David Yow, Roky Erickson, even Robert Plant) while walking down the street. It’s a crucible though, for local bands. Even if you’re good by most standards, you have to stand out above the crowd – most of which have come from all over the world to be in a place that holds music in such high regard. Austin is a town where working hard isn’t enough – you have to have something that people haven’t seen before, and even that doesn’t always guarantee success. And yeah, South By Southwest is insane. I can’t even begin to describe it. What have been the best, worst and weirdest things about being in Lions Of Tsavo? Ryan: The best and weirdest things would have to be that this music we’ve created has reached people around the world and allowed us to travel and meet so many other awesome bands and individuals. The worst thing would maybe be that we’ve yet to find a home at a record label with which we can build a lasting relationship with, and that could get our music out into the world even more. Daine: Josh and Ryan are two of the most talented people I’ve ever had the pleasure of playing music with, which really makes being part of this band an incredible experience. But when you play a style of music that isn’t easily defined or fit into some sort of predefined genre, you’re really at an automatic disadvantage. Music in the 21st century is unlike it has ever been in the past; instruments are cheap and easily obtained, so being in a band is easy – but it’s extremely difficult to sell your songs and recoup the costs of the process. So I’d say the worst thing is dealing with finances and trying to make enough money to be self-sustaining. The weirdest would definitely be some of the DIY shows we’ve played on tour. Very strange things happen in small towns. Ryan: Next things are to get the songs completed for the next album, do some touring to road test them a bit, and then hopefully get them recorded before the year is out. I can only hope that each record we make is better than the last one, and that we can convert more and more people to our particular brand of noise. Daine: Oh man, I’d love to see ‘Traverser’ get the vinyl treatment. I think the artwork would look incredible in the bigger format. Ideally we’d like to do a bigger tour, and actually have a booking agent instead of booking everything ourselves! That would be nice. Oh, and a split release with our friends in Inter Arma. We’ve talked about it and I’d love to see that happen.